A PROPERTY in Maleny has been transformed into a Hollywood-style movie set to film a trailer for a movie about the anti-bikie laws. The film, "Patched", tells the story about how "two brothers and a brotherhood were torn apart by the anti-biker laws". 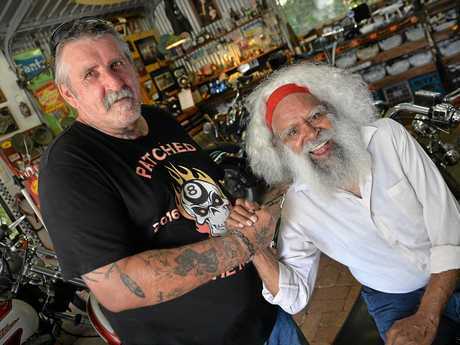 Already a stellar cast, including famous indigenous actor, Jack Charles (who starred in Hollywood blockbuster Pan), has put their hands up to be involved. Patched is the brainchild of long-time Maleny resident, actor, film maker and motorbike enthusiast, Colin "Spida" Dickson, who will also star in the film. Tony Nixon, who starred in the Chronicles of Narnia, has been selected to play the role of former Queensland Premier, Campbell Newman. But who will get to play the significant role of former Attorney-General and Member for Kawana, Jarrod Bleijie was yet to be determined. Producer, Sue Wiseman, said Mr Dickson had been working on a film about bikers for several years, but the idea really took shape after the former State Government introduced the Vicious Lawless Association Disestablishment (VLAD) laws in 2013. "It's about two brothers and the way the VLAD laws is going now where it has gone pear-shaped in Queensland," she said. "You can't even go out (as a member of a bikie gang) as a family." She said the script was been worked on, but it was envisaged Mr Bleijie's role would be quite significant. Charles plays the "preacher" in the film and another well-known actor, Rob Morgan, who starred in Mel Gibson's Hackshaw Ridge, is also in the cast. All that Patched lacked to bring it completely to life on the big screen was a significant injection of funding. Filming took place in Maleny this week for section of the film with "around $200,000" still needed for it to be able to be finished. "Another $200,000 will make it the best movie in Australia," Ms Wiseman said. Ms Wiseman it was planned the whole film would be shot in Maleny and the hinterland community was very excited to see what was happening. "It is a fictitious movie, none of these people were part of gang, not even Colin," she said. The first trailer has received thousands of likes on YouTube and they have been approached with an offer to do the distribution of the film in the United Kingdom. In his online fundraising page, Mr Dixon said the Patched was a "true Australian gritty action drama". "We envisage the rest of the cast, where possible, will be from the local film industry, and the crew will sourced from Queensland as we want to show that you can make independent films here in Queensland and they can be successful," Mr Dixon said.